In March 1989, HM Ships Berkeley, Chiddingfold and Cottesmore and RFA Diligence were the first RN ships to visit Aden since the People’s Democratic Republic of Yemen (PDRY - otherwise known as South Yemen) achieved its independence in 1967 after 128 years as a British possession. A year after this visit, South Yemen was reunited with its northern neighbour to form the Yemeni Republic. I was commanding Berkeley at the time and our group was returning to the UK from an 8-month deployment in the Gulf for Operations CIMNEL and ARMILLA ACCOMPLICE. Our mission had been to provide the world’s shipping community with confidence that the sea lanes between the Strait of Hormuz and Gulf Cooperation Council (GCC) ports as far as Bahrain were clear of mines in the wake of the Iran/Iraq Tanker War. By the time we returned home, our colleagues in Chiddingfold had clocked up 268 days away from base and set a new deployment record for a minor war vessel. We had not originally planned to visit Aden but our programme was altered following a whistle-stop tour of Arab nations by the then Foreign Secretary, Mr William Waldegrave. Thus Defence Diplomacy dictated we should visit Aden and Tunisia instead of sampling the delights of Malta and Majorca. In the event, Diligence anchored off Steamer Point without complication and our Hunt Class MCMVs rafted up alongside her. This was where the USS Cole would be attacked by a suicide boat in Oct 2000. Chiddingfold was duty liaison ship for the visit so her CO went off to pay the arrival calls while Berkeley and Cottesmore rigged their foc’sles for the first night cocktail party. The CO of Cottesmore, Lt Cdr (later Cdr) Brian Mansbridge MBE RN, and I took the opportunity to stretch our legs ashore. 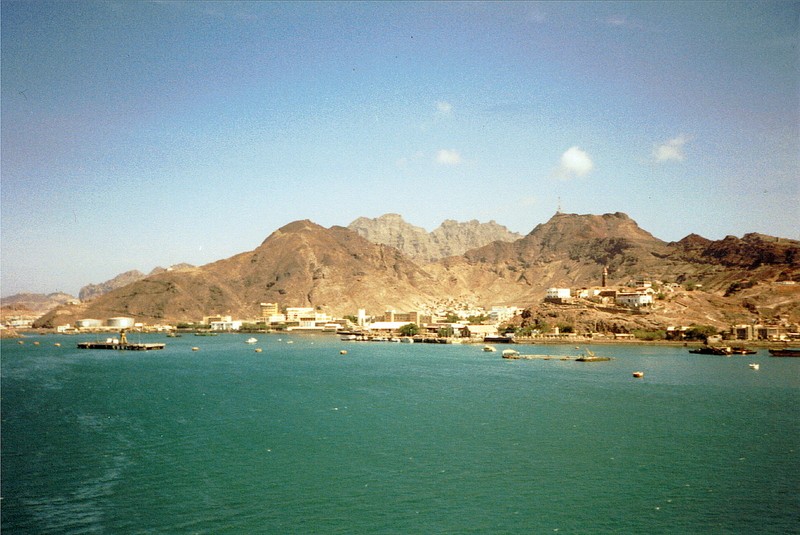 Aden was a living museum in which time seemed to have stood still since the 1960s. We found a drab and dusty city of near-derelict buildings and shops selling mostly second-hand goods. The blocks of flats once used as British married quarters were extremely shabby and had obviously not seen a lick of paint or any other noticeable sign of maintenance since the departure of their former tenants. The few cars on the pot-holed roads mostly comprised battered Ford Anglias, Prefects, Populars, Zodiacs and Zephyrs, legacies from the British forces who had evacuated the place 20 years previously. When entering harbour we had noticed several jelaba-clad townspeople literally jumping for joy on the dockside. As we walked about the streets we were approached by locals, some with tears in their eyes and all eager to recount their past employment as drivers, electricians or mechanics for the Crown during the latter stages of the British forces’ presence. "Russians no good, no bloody good!" they whispered to us conspiratorially. The Russians had occupied the vacuum left by the British departure and had spent the previous 20 years constructing a new power station, airport and hospital, mostly through their Cuban proxies. None of these projects had reached anything like completion. Seeking the inevitable postcards, we entered a shop that sold everything from second-hand bath plugs to electrical appliances and hearth rugs but specialised in old British military insignia and accoutrements. We noticed the owner had an ancient portable radio on a shelf behind the counter and it was tuned to the BBC’s world service. My companion asked him if he listened to the BBC very often. "Every damn day for the past 20 years," he responded emphatically. After a quick recce, we returned on board and prepared ourselves for the cocktail party. This was a truly international affair held on the adjacent canopied forecastles of Berkeley and Chiddingfold. If memory serves me right, there were diplomatic representatives from over 50 countries including such intriguing combinations as Soviets (this was at the height of Glasnost and Perestroika) and Cubans, Iranians and Iraqis, Greeks and Turks, and Israelis and Syrians. The Americans had no diplomatic mission in Aden and were conspicuous by their absence. The innocuous-tasting punch prepared by the stewards worked its magic and soon all of our guests were engaged in animated but entirely amicable discussion. I was buttonholed by members of the Cuban mission who were keen to extol the improvement in social welfare and medical attention enjoyed by the local population since Aden had ceased being a British Crown Colony. Many of the Arab diplomats spoke knowledgably about Britain and a high proportion seemed to have pieds-à-terre in London. The next day, a member of the British Embassy staff gave the COs a guided tour of Aden, including Crater City, in a Japanese 4x4 jeep-type vehicle. The suspension of this vehicle left much to be desired but this was hardly surprising; Crater City is so called because it lies in the crater of a dormant volcano but the description applied equally to the condition of its roads. Despite our appeals for him to take it easy, our driver regarded every obstacle and depression as a challenge to be overcome with speed. In the back of the vehicle, we bounced up and down with our heads smashing painfully against the unpadded roof. I am certain the odd recurring pang in my neck is a direct consequence of its repeated compression during that bucking bronco of a ride. Near the airport at Khormaksar we were shown the only hotel in town. It still lay ruined and unused as the result of the ‘emergency’ and the countless civil wars that followed it. We were also shown where a busload of Argyll and Sutherland Highlanders had been ambushed by rebels armed with machine guns and grenades and other places where members of the British garrison had fought vicious street battles during the uprising. At long last I was able to put into context the nightly news stories describing Lt Col Colin ‘Mad Mitch’ Mitchell and his men fighting their bloody rearguard action in 1967. The small European community consisted almost exclusively of diplomatic staff, all of whom were endowed with a siege mentality. They were extremely pleased to see us and our ships and gave us a splendid welcome. Strangely, the British Embassy had been re-occupied in an almost untouched state when diplomatic relations had been restored a year or so previously. Another privilege afforded the UK in Aden was the country designation ‘1’ on the CD plates of its diplomatic vehicles. That evening, COs (plus 1) were invited to an al fresco evening reception at the British Embassy but, in the words of Sondheim’s musical, a funny thing happened on the way to the forum. As we stepped ashore at Steamer Point in our immaculate ice-cream suits, I noticed a black Zil with local number plates parked on the jetty facing the harbour. In the front sat two sinister-looking men in sunglasses, the driver peering through binoculars at our ships while his passenger took notes. His reply confirmed my suspicions. "They’re spooks from the Russian Embassy. It was an opportunity too good to miss. Unnoticed by its occupants, I strolled over to the car and knocked gently on the driver’s window. The driver was startled and looked up at me with embarrassment. He wound down his window. "Hello," he replied somewhat nervously. "Your ships... are they new?" he asked in broken English. A deliciously wicked reply came into my mind almost immediately instead of five minutes too late as so often happens. "Do you know..." I said. "They're so new, we haven't had time to fill the swimming pools yet." After a moment to digest this vital piece of intelligence, the driver gulped and said, "Spasiba... thank you. Goodbye." He then started his engine and reversed quickly from the edge of the jetty before driving off in a cloud of dust and an accompanying squeal of tyres. Move over 007! At the Embassy, we sat at table in the pleasantly manicured grounds thankfully devoid of marauding insects. As we relaxed and were served by attentive staff, I reflected on my good fortune in being privy to this example of fast-disappearing quasi-colonial life for one last time before returning home. I was seated next to the Italian Ambassador, a huge and jovial bearded man in the same mould as Pavarotti. "How long have you served here?" I asked him. He boomed back at me, "In my country, if you are a naughty boy they send you to Aden for two years. Me…" he declared proudly, "...I’ve been here for three." The rest of the dinner party passed in an exquisite haze of good food, fine wine and entertaining conversation followed by port and cigars. The following day was our last in Aden as we were due to sail in the afternoon. During the forenoon, I accompanied my fellow COs to call on the Yemeni Naval Commander. We had noticed a motley collection of ex-Soviet Osa class FPBs, Natya class minesweepers and Alligator class landing ships in the harbour. Most were listing in the water and few looked seaworthy. The old British naval base occupied by the Yemenis was also in a sad state of repair. "Looks like they haven’t had rounds since the Brits left," remarked one of my companions. An aide ushered us into the Commander’s office and he rose to greet us. He wore the insignia of commodore on his crumpled fatigues and his office was cluttered with dusty heavy metal busts and stylised pictures of Marxist political leaders and patriotic heroes. No two items of furniture matched each other. For all that, he was most hospitable and offered us the Russian equivalent of Tango with a straw protruding from the neck of each bottle. Thankfully, it was chilled. The conversation was amicable as we exchanged pleasantries and it was evident that our host held the RN in particularly high esteem. We left with the feeling that we had made a favourable impression on him. We sailed that afternoon without further incident but I wish I had kept a copy of our collective visit report. According to rumour, it had CINCFLEET in stitches at his morning brief and we received a particularly appreciative reply.